"There is no questioning the pedigree to which the X-Fi Bravura is associated with a high sound quality across all forms of media. Perhaps not quite as strong in the gaming scene, the card still performs well and excels, in particular, for music and movies with a high dynamic range, clarity and overall experience.... The defining feature of any sound card has to be its enjoyment factor though and enjoy the X-Fi Bravura we sure did with the improved sound quality adding to the surround experience whether it is through music, movies or during gaming... The bottom line is, the Auzentech X-Fi Bravura with its superb sound quality, high calibre components and OPAMP upgradability, should be one of the first on your list if you’re looking to upgrade or invest in a fantastic sound card." "the Auzentech X-Fi Bravura is a very well designed sound card, as we have grown to expect from the company. It delivers decent audio quality over the analog multi-channel output, but where it really shines is the discrete amplified headphone circuit for audiophiles preferring to listen to music with the cans." 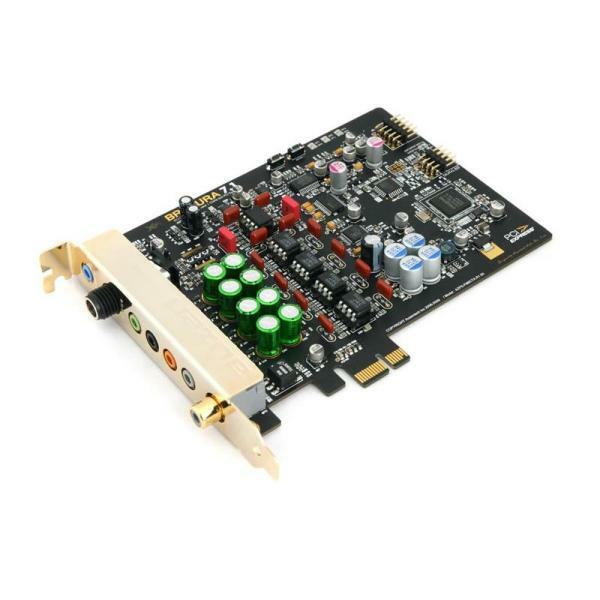 The X-Fi Bravura 7.1 sound card is now in stock.